This summer’s prolonged heatwave has led Brits to want to indulge in something cold and creamy more than ever. According to Mintel/IRI, the value sales of ice cream rose to £1.16bn in 2017. Strong category growth is predicted over the next few years. Ice cream is one of the dairy categories where innovation has been widespread and manufacturers are looking to sustain continued growth by tapping into multiple functional consumer needs. Could there be opportunities here for on-farm ice-cream producers? According to Mintel/IRI, the value sales of ice cream rose to £1.16bn in 2017, and strong category growth is predicted over the next few years. Ice cream is one of the dairy categories where innovation has been widespread and manufacturers are looking to sustain continued growth by tapping into multiple functional consumer needs. Kantar Worldpanel reports that health is one of the fastest growing drivers of consumer choice of food products. Although still behind foods chosen for enjoyment and convenience, health is becoming increasingly important. Health means different things to different people, however. For some, it is more about cutting calories, some are seeking to reduce sugar or fat and some want more added-value benefits such as containing high levels of particular nutrients such as calcium, or containing probiotics. Products that can make multiple health claims tend to do best. While ice cream has traditionally been consumed as a more indulgent product, things are now changing as manufacturers seek to play in the ‘permissible indulgence’ space. By creating new formulations that reduce sugar or fat, or radically reduce the calorie content, producers are appealing to a new generation of more health-conscious consumers. 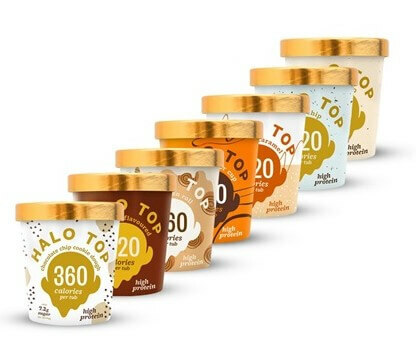 Most prominently has been US ice-cream brand, Halo Top. Launched in the UK in January 2018, it is the number 1 selling ice-cream brand in the US, according to The Grocer. There are ten different variants in the range including such flavours as chocolate chip cookie dough and red velvet. They boast of having as few as 280–360 calories for an entire tub and are low in sugar and high in protein. 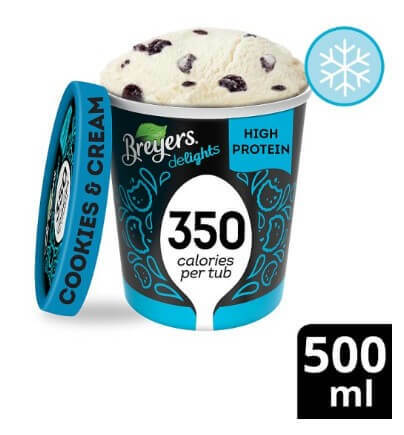 Other manufacturers, such as Breyers and Wheyhey have launched other products in the same space with similar claims. Amid this backdrop, dairy-free ‘ice cream’ is also a growing trend in the UK, with brands such as Booja Booja and Alpro entering the market and existing ice-cream brands such as Ben and Jerry’s producing vegan-friendly variants. 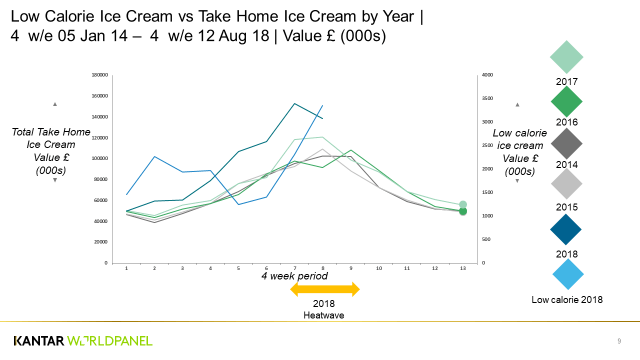 Standard take home ice cream has had a strong year, thanks in part to the unusually prolonged spell of hot weather with value sales growing strongly ahead of typical years. But the heatwave has also helped maintain strong sales of low-cal ice cream as well. According to the NFU, Britain has over 60 dairy farms that are producing ice cream on farm as a way of adding value to their milk and diversifying their operations. Farm-produced ice cream has a unique selling point (USP) in terms of provenance, traceability and use of natural ingredients – all attributes that resonate strongly with consumers. Although healthier ice cream is a growing trend, it is important to recognise that it is only part of the picture. 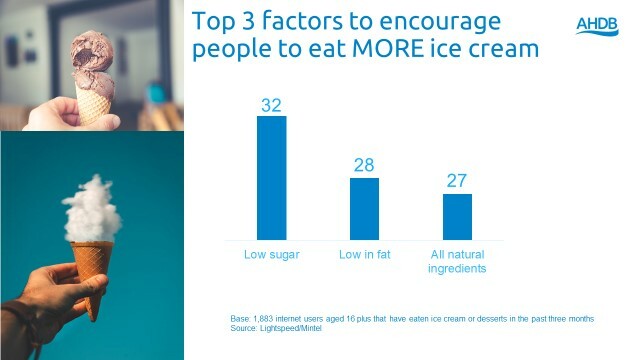 According to Kantar Worldpanel, low-cal ice cream is worth only 2% of the market by value, only 1% by volume. However, with new variants and flavours entering the market, it is safe to assume there is significant headroom in this figure. Farms producing ice cream may be able to capitalise on this trend by looking at their ranging. There may be opportunities to reformulate/launch some variants that offer more health benefits by cutting sugar and looking to increase protein content to produce a product that is better for you and confers all the benefits of provenance and locality that consumers get from farm-produced ice cream.